We present a new mixed reality approach to achieve tangible object manipulation with a single, fully portable, and self-contained device. Our solution is based on the concept of a “tangible volume.” We turn a tangible object into a handheld fish-tank display. Our approach, however, goes beyond traditional fish-tank VR in that it can be viewed from all sides, and that the tangible volume represents a volume of space that can be freely manipulated within a virtual scene. This volume can be positioned onto virtual objects to directly grasp them and to manipulate them in 3D space. We investigate this concept with a user study to evaluate the intuitiveness of using a tangible volume for grasping and manipulating virtual objects. 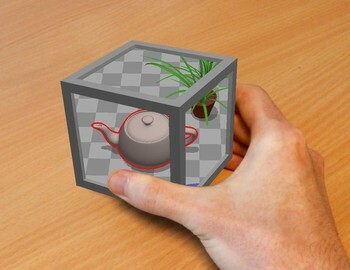 The results show that a majority of participants spontaneously understood the idea of grasping a virtual object “through” the tangible volume.